How does someone get fat? They eat too much, right? Energy (calories) coming in is in excess of energy going out. That means weight gain in the form of either fat mass, lean mass, energy stores (e.g. glycogen), water, etc., or likely some combination of those. When we overeat calories chronically, weight gain results. “Stop eating so much and you’ll lose fat”. 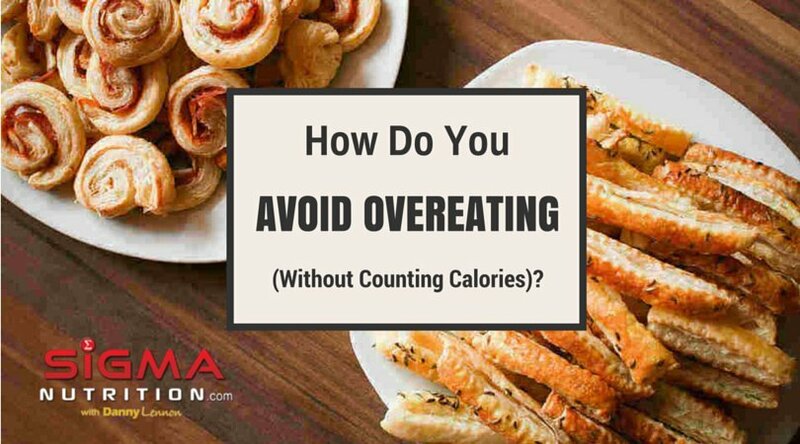 If you eat at a caloric intake that puts you into a calorie deficit (i.e. the energy you consume is less than that you expend) then you’re bodyweight will drop. It also does not distinguish between the type of weight lost ( i.e. how much of the weight lost was from actual fat mass as opposed to lean mass, water and glycogen). But I’ll come back to that issue in the next post. For now, let’s consider what’s driving the overconsumption. The numerous potential reasons for subconscious overconsumption are the reasons why we get fat. We’re talking about those subconscious behaviours that drive excessive calorie intake, which in turn leads to fat gain (or prevention of fat loss at least). If we can get to the drivers of over-consumption and address THEM, then we can tackle the ACTUAL cause of fat gain. Picture what daily life looks like for most people in the developed world. The environment and situations we are surrounded by on a daily basis are essentially a perfect combination of ingredients to make over-consuming calories as easy as possible! Virtually unlimited access to highly refined, palatable, calorie-dense foods – If you really wanted to, how difficult would it be to get hold of something calorie-dense, high in sugar, high in fat and tasted amazing within the next 5 minutes? I’m guessing “not very”. Continuous cues to eat – Marketing advertisements, inviting-looking fast food shops, calorie-dense processed treats located next to every shop and petrol station checkout, product placement on TV, et cetera. So with all this in mind, it seems like it has never been easier (and more likely) that someone will become overweight or obese. Our body has several feedback systems to communicate when we’ve eaten enough or have sufficient body fat stores. This is a complex web of communication pathways involving parts of the brain and various actions of the endocrine system. The most attention is usually placed on the action of the hormone leptin. And for good reason. Leptin can be thought of as our most important regulator of body fatness. We signal to the brain that we have inadequate energy stores/negative energy balance by reducing leptin levels. When leptin increases to sufficient levels it signals to the brain to suppress appetite and increase energy use. brain gets the message that there is sufficient body fat present and so it puts mechanisms in place to prevent us gaining more body fat. In fact, leptin can even respond to increases in our calorie intake before any changes in body fat levels take place. So overfeeding in the immediate term will affect leptin levels. This has been the basis for the propsed physiological benefits of refeeds during dieting phases (addressed HERE). So while leptin is the method of communication between fat tissue and the brain, our brain also receives important information, on which to base it’s drive to eat on, from other tissues. Ghrelin is produced by cells in the stomach, with increased ghrelin levels stimulating appeptite. Cholecystokinin (CCK) produced in the small intestine decreases appeptite. It is well known that the success of gastric bypass surgery in treating obesity is largely associated with the reduced appetite patients have after the surgery due to increases in PYY and GLP-1. When the responses of these hormones were inhibited by researchers, patients experienced a return of appetite and increased food intake. Gut hormones are an extremely important factor when it comes to keeping weight off long-term. Basing anti-obesity therapy on the actions of these hormones has even been hypothesised. Similarly, the appetite-reduction many people report on a ketogenic diet seems to be down to effects on appetite-inducing hormones like ghrelin. In the current environment we’re surrounded by, it has never been easier (and more likely) that someone will become overweight or obese. Our body has several feedback systems to communicate when we’ve eaten enough or have sufficient body fat stores to STOP us gaining excessive weight. How can we have all this intricate communication between our brain and the cells of our fat tissue or of the gut, that supposedly prevent excessive fat gain, yet as a society we’re finding it so damn hard to NOT gain body fat? The logical answer is that there must be some sort of breakdown in that communication. There’s something up with the signalling between the brain and gut and/or fat tissue. It’s dysfunctional. There are many places something can go awry, some of which I’ll get to in a later post. But for this post, I’m going to just focus on one, leptin resistance. One well-established and potentially most important example of that “dysfunctional communication” I mentioned is leptin resistance. As mentioned earlier, leptin is produced by fat tissue and leptin levels are detected by the hypothalamus in the brain. This system is our major regulatory system of body fatness. The hypothalamus detects leptin levels via leptin receptors which sit on neurons (nerve cells) there. So the problem of dysfunctional communication is essentially these leptin receptors not working as they should. Hence, the brain underestimates how much leptin is present. The result? More leptin is needed to get the message across that the person is not starving. If more leptin is needed, that means more fat is needed. And if more fat is needed, that means more food intake is needed. Obese people thus have an elevated bodyweight that their the body begins ‘defending’. But what exactly causes leptin resistance of the receptors in the hypothalamus? This is a massively complex and dynamically evolving area of research so we certainly don’t have all the answers on this. Additionally, the point of this post is not to go into detail on leptin resistance so please forgive if some details are skipped over. But what exactly causes someone to continue to overeat when body fat is already high and so leptin is elevated? In other words, how does someone become severely overweight? 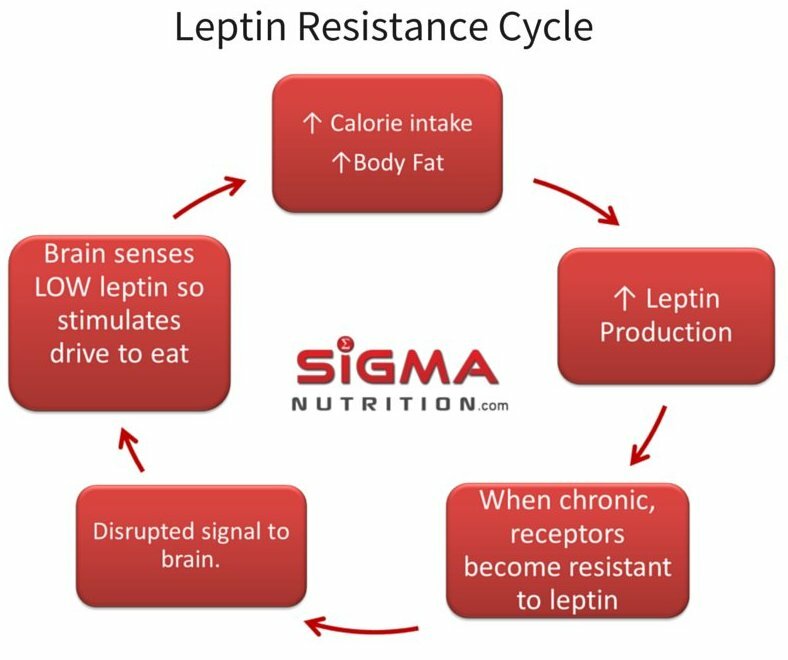 A deep look into the etiology is well beyond the scope of this post but if you’re interested in this area I’d highly recommend watching the brilliant Dr. Stephan Guyenet’s presentation “What Causes Leptin Resistance?” below. As well as reading EVERYTHING on his blog (here). I use “non-willpower intake regulation” to describe the ability to regulate our own dietary intake without having to use lots of willpower to avoid overeating. If we can master non-willpower intake regulation then in theory we should be able to eat at a suitable caloric intake to avoid fat gain, without feeling deprived or having to dig into reserves of willpower to ensure we stick to small, unsatisfying portions. Actually being dialled in and listening to them! In episode 50 of the podcast on caloric density I brought up the concepts of satiety and satiation. In terms of understanding how to make a hypocaloric dieting phase as bearable and hunger-free as is possible, I HIGHLY recommend taking 15-20 minutes to listen to that episode. But nevertheless, I’ll mention a few cliff notes that overlap with the context of this post. Satiety is your body’s response to the availability of nutrients from food that you’ve ALREADY digested and processed. Satiation is your immediate reaction to the ingestion of food. It’s that initial drive you get to stop eating. Think of satiation as a best-guess of your future satiety by your body. It makes this estimate based on different sensory inputs like smell, taste, texture, and stomach distension (i.e. how much it expands/stretches). Graph created based on data from: S.H.A. Holt, J.C. Brand Miller, P. Petocz and E. Farmakalidis, “A Satiety Index of Common Foods,” European Journal of Clinical Nutrition,September 1995, pages 675-690. As you can see from the above graph, potatoes have an amazingly high satiety index. Hence why they’re such a great addition to meals. At the other end of the scale, is it any wonder why people who start their day with pastries and jam are usually reaching for a snack perhaps only a mere hour later? But let’s pull this back into some practical applications. What exactly can we take from all this to be able to maximise our ability to avoid the progressive fat gain over time that seems to be almost expected these days? Choose foods of high fibre and/or water content so that you can eat a larger volume of food but stay within a certain calorie limit due to their effect on satiation. Good choices include vegetables, fruits, lentils, chickpeas, beans, soups and stews. Even sugar-free jelly (jello for my friends Stateside) can be a helpful tool. 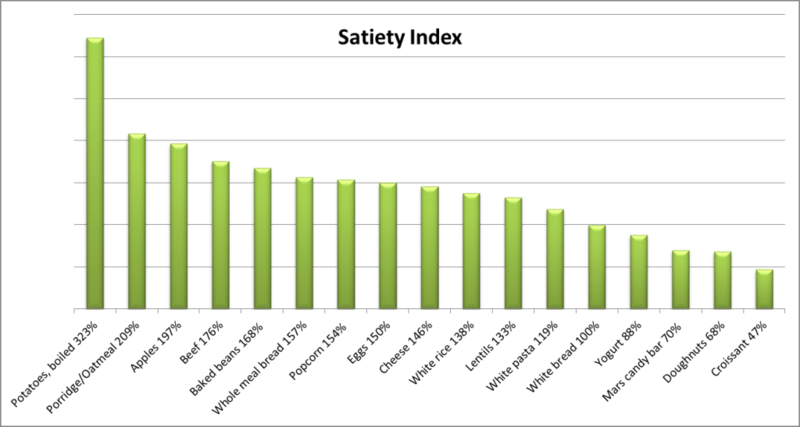 Choose foods with a high satiety index. This is where a high protein diet pays dividends. Potatoes can be great too. Maybe even have them cooked-then-cooled if you want to increase prebiotic fibre content. Don’t forget about the overall quality of the diet. So don’t go cutting out any foods unnecessarily. Nuts, eggs and coconut oil are still cool to have! Caloric density is just one consideration/tool. Don’t Become Excessively Fat – Yes, this may seem ridiculously silly but bear with me. Inflammation is one of the primary causes of leptin resistance. And it’s been shown that excess body fat can cause secretion of inflammatory factors. Diet Quality – Another thing we know is pro-inflammatory are diets high in highly-refined, processed food. The typical “junk food diets” you see used in research studies. In addition to inflammation, a diet high in these foods will contain more foods that are hyper-palatable and thus more likely to be overconsumed. This doesn’t mean avoiding every single processed food. It just means the majority of your intake (say 80-90%) should be from minimally processed “real” foods (à la the Sigma System!). Physical activity – Exercise and being active has been well shown to increase leptin sensitivity as well as decreasing inflammation. Fermentable fibre – Fermentable fibre has positive benefits on the gut microbiome. This promotes the maintenance of a healthy gut lining, which is critical in keeping out endotoxin/LPS from the bloodstream. LPS is highly pro-inflammatory and this can be a contributor to leptin resistance (as mentioned by Stephan Guyenet in the video above). In episode 52 of the podcast I talked specifically about fermentable fibre, giving sources and daily targets too. Sleep – pretty much NOTHING works as it should when you’re sleep deprived so it should come as no surprise that it will lead to decreased decision making and increased drive to eat the following day by influencing the hormones we’ve talked about in this post. Fish Oil – EPA/DHA has been often shown to potentially be an easy addition that can help to decrease hunger. It has even been hypothesized that fish oil supplementation could “reduce the reward associated with food, thereby reduce appetite and food intake, and ultimately contribute to the prevention or reduction of obesity”. Yet again it comes down to the fundamental blocks of health: overall diet, sleep and activity. Let me know in the comments if you’ve successfully being able to regulate body composition without having to use lots of willpower or to track every calorie. Alternatively, if you found tracking calories/macros was a better option for you, let me know about your experiences too.